Owning an older home oftentimes means focusing on upgrades to make a property look more appealing as it ages. 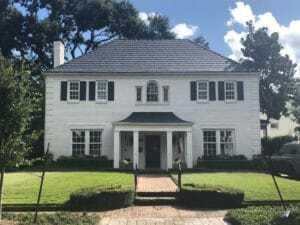 For Houston homeowner Beth McEntee, the switch to a synthetic slate roof came from both the desire for a more attractive roof and the necessity of saying farewell to an older leaky roof. Just like many homeowners, McEntee started her search for a new roof online, by visiting roofing company websites and Houzz.com. With the roofing product decision made, McEntee worked with her roofer, FairClaims Roofing & Construction, and a DaVinci representative to select Bellaforté Slate composite tiles in a Slate Black color. “We decided that black would best complement our traditional colonial style home that has mostly a white exterior with a black door and shutters,” says McEntee. “I loved working with FairClaims and DaVinci, both of whom were incredibly helpful in the planning process. For the McEntee home, the team at FairClaims removed laminated shingles that had deteriorated badly over the years. “The active leaks in this roof were really beyond repair and the homeowners made a smart decision to invest in a new composite roof,” says O’Neal.